Cavan Singers began out 2011-12 singing year by performing a short after-dinner concert for the delegates at the County Cavan Childcare Committee annual conference in the Cavan Crystal Hotel on Friday Oct 7th. Musical Director for the evening was Sue Donohoe, and accompanist was Eileen Tackney. Soloists from the choir were Brian McKeever (Bass) and Nora Kennedy (Soprano). The audience was appreciative and it was a good start to our singing year. Fleadh 2011 - singing in Newcourt archway! 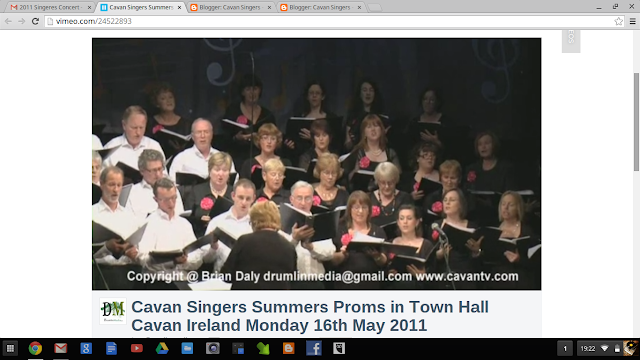 Thanks to Patsy Lee for posting these videos of Cavan Singers performing in the Newcourt archway in Cavan during Fleadh 2011. 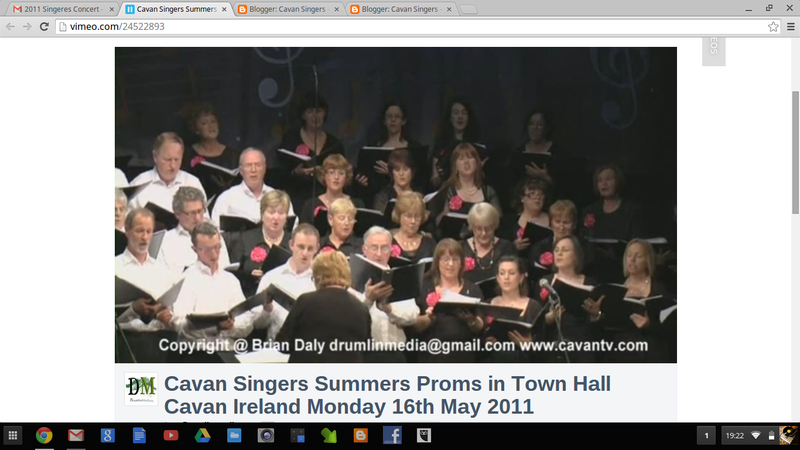 Rehearsed and conducted by Sue Donohoe, Cavan Singers joined Sue's Cavan Symphonia in an hour long performance of Irish music and song. As can be heard and seen on the videos, the crowds loved it. Please excuse the background noise - after all there were about 250,000 people from all over the world in town that day! 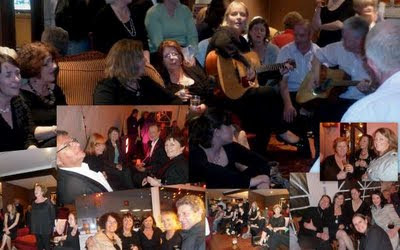 Cavan Singers travelled to the Dunmore Choir Festival this weekend, and what a wonderful weekend it turned out to be! Hosted by the Dunmore Choir, two nights of choral singing by choirs from all over Ireland took place in an excellent venue, the concert hall of Dunmore Community School. We sang on the Saturday night to a packed house, preceded on the programme by choirs from Kiltimagh, Drunshambo, and followed by choirs from Celbridge and Dunmore. It was great for the choirs to hear each other sing in a relaxed setting. Each choir sang a short programme, the finale was a mass chorus of Handl's Hallelujah, and the hosts made a presentation to each of the Musical Directors. Congratulations to the organisers in Dunmore, and our thanks for the refreshments provided in Walsh's afterwards. Cavan Singers stayed in the McWilliam Park Hotel in Claremorris, where we met with the Celbridge choir, whose MD is Cavan's own Ciaran Duffy, who has often sung with Cavan Singers in the past. The two choirs joined in a livley Après Sing which is runoured to have lasted into the wee small hours...but as the saying goes, "what goes on tour..."! 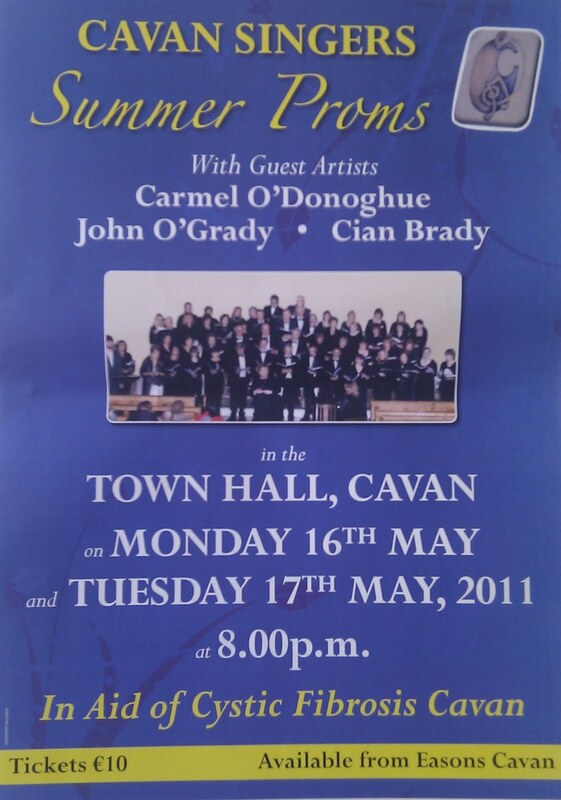 We have just had two wonderful evenings in the Town Hall Cavan, at our Summer Proms in aid of Cavan Cystic Fibrosis. Our choir, led by Winnie Hughes our Musical Director and Sue Donohoe our accompanist, sang with local soloists Carmel O'Donoghue, John O'Grady and Cian Brady. Cian also performed a duet with Pauline Brady (soprano), and John O'Grady was joined by his band. The programme also featured a lively traditional Irish section also, featuring local musicians Aoife Cunningham, Karen Dolan, Gareth and Seamus Tierney and dancers Áine and Claire McDermott. The Proms was streamed live by Drumlin Media on Monday night, which meant that family members and indeed choir members were able to watch from afar on the web. The video stream is available here ...Enjoy! Many thanks to Brain Daly for this. Cavan Singers present two evenings of Summer Proms this May 16th and 17th in the Town Hall, Cavan. 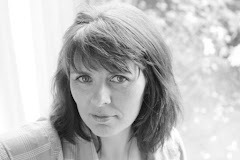 We will sing with Guest Artistes Carmel O'Donoghue, John O'Grady and Cian Brady. Proceeds of the concerts will go to Cystic Fibrosis Cavan. Tickets are €10, available at Eason's Cavan.